Experts expect the nursing profession to grow at an above average rate of 15% over the course of the next decade. This means more nursing jobs will open up, which doesn’t necessarily correlate with an easier job market. Instead, hiring managers may expect to see candidates with more experience or certain skills, which limits who can get the job. A strong resume can make you standout from other applicants. When you have a document that clearly shows off your skills, accomplishments, and experiences, you have a better chance of wowing employers. A hard-to-read file, on the other hand, could leave you stranded in the reject pile. If you want to speed up your job search, turn to staff nurse resume templates. These tools help you perfect the format of your resume while giving you advice on the type of content to include. Check out our helpful guide! Why Use Staff Nurse Resume Templates? You’ve spent ages crafting the perfect resume, but did you know most hiring managers will give your document a mere six-second glance before deciding whether your application moves on? Because recruiters scan the document so quickly, you need to know how to build a readable, stand-out resume. Staff nurse resume templates make it easy for you to create an impressive file that’s reader friendly. As you search through the available staff nurse resume templates, you’ll find they typically fall into three categories: functional, chronological, or combination. These terms relate to the order of the document. A combination file, for example, simultaneously focuses on work history and skills to better get the attention of recruiters. This order works well for someone trying to change careers. Resumes with a single page often pass over the desk of hiring managers. Recruiters like this layout because it forces applicants to be succinct and organized. If you recently graduated from college, have limited work history, or want a part-time job, a one-page resume could fit your needs. Even if you have lots of experience, your conservative employer may want a shorter document. Professional documents have to create a lasting impression to achieve success. The popular staff nurse resume templates offered here have a great track record; they’re popular for a reason. Look through the formats listed here to find the best option from each category. This can help you decide which layout you prefer for your own file without doing too much tab surfing. Today’s job search has lots of unique hurdles. The applicant tracking systems, a scanning software for resumes, often acts as the first roadblock for modern jobseekers. Not all resume formats are ATS friendly. Contemporary layouts with pictures and graphs, for example, get jumbled in the software. If you know your resume has to get past ATS, you should use a simple format. Are you looking for staff nurse resume templates flexible enough to catch the eye of a modern employer? If you try to get a job as the on-site nurse for a startup company, you’ll need an edgy, informative document if you want to stand out. 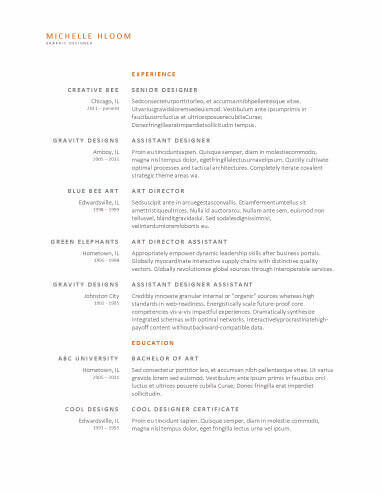 modern resumes focus on skimmability, social media, color, and font. The staff nurse resume templates make it easy for you to figure out how to format your document, but you can still struggle to know what to say in your document. Should you mention your internship or talk about the yearly seminars you attend? Thankfully, you don’t have to figure it out on your own. Check out this guide that tells you what elements you should consider including in your file. Still need more advice? Check out this checklist to make sure you include the important info in your resume. List your full name. You should only include variations of your name, such as your maiden name or middle name, if you use it professionally. Write out the city and state you live in. Most employers don’t need you to write out your entire mailing address, but you can if you want to. Include your best contact number. Aim for a cell or home number rather than a work number. Use a professional email address. Consider one with your name as the handle, but remember not to use an old college server. Point out your LinkedIn profile, if you have one. Make sure you update the page before adding the URL to your document. Pick the statement type that fits your needs. This paragraph should make the hiring manager want to keep reading. Summaries go over your most relevant experiences, skills, and accomplishments to show recruiters what you can do for their company. As a modern option, most candidates will benefit from this type of paragraph. Objective statements point out what you hope to gain from the experience. This opener can come across as outdated, but works well for people with little experience. Read through the job description to find the skills the employer wants to see. Whenever possible, use key phrases in your list. Create succinct, buzzworthy phrases. Entire sentences in this section can make it harder to read. Use bullet points to increase readability. Try to include four to six skills. Create a consistent format for this section. Include information about the position title, company name, and start date. Discuss three to five impressive responsibilities and accomplishments for each position. Remember, adding metrics makes your experience stand out. Keep this section as relevant as possible. You don’t need to include your summer jobs from high school if you have over a decade of other experience. List out the degree name, area of study, and university name for each degree you have. If you graduated recently, you can include the graduation year. Point out special certifications you have or seminars you attend. This can show a desire to continue learning. If you really struggle to perfect your resume, you can find even more help. Yes, the staff nurse resume templates give you a great place to start, but did you know resume builders can make the entire writing process easier? Through this resume-writing tool, you get advice and guidelines tailored to your career. Not only does our resume builder provide a lot of benefits, but it’s also easy to use. After completing these three steps, you’ll have a finished professional document. After that, you simply have to read through it to make sure the document matches your personality before sending it out to a recruiter.